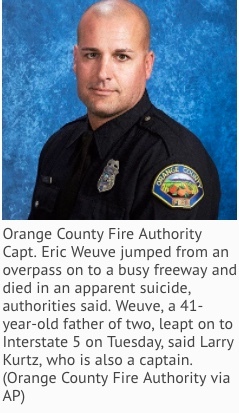 Tuesday’s apparent suicide of an Orange County Fire Authority captain is part of a sad trend among firefighters. In 2015, 132 firefighters committed suicide in the U.S. – a bigger number than those who died of job-related injuries and illnesses, according to figures provided by the California Professional Firefighters union. In addition, a national study of 1,000 firefighters, by researchers from Florida State University, revealed that nearly half of the respondents say they had suicidal thoughts at one or more points in their careers. About 15 percent reported one or more suicide attempts. One cause may be post-traumatic stress syndrome, similar to that experienced by military personnel in combat, that can take an emotional toll on firefighters with their high-stress duties, according to the International Association of Firefighters. The Orange County Sheriff’s Department and California Highway Patrol are investigating what prompted Eric Weuve to jump from the Crown Valley Parkway overpass onto the I-5 freeway in Mission Viejo, where he was fatally struck by a big-rig.